Vernon Adams Jr. supports his fellow QB's. 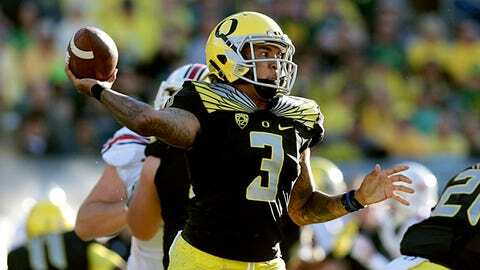 QB Vernon Adams Jr.'s career at Oregon hasn't gone the way he planned. After getting off to a hot start against Eastern Washington, Adams broke his right index finger, has sat out two games and has suffered two losses. However, the graduate transfer appears to be in a good place and is ready to support whomever is Oregon's starting QB. It it not know whether Adams, redshirt junior Jeff Lockie or redshirt sophomore Taylor Alie will start for the Ducks on Saturday against Washington State.